Our hostel is small and peaceful, and is just a short walk from the city. We offer 10% discount on all tours pre-booked through our website to our guests. Check out our free stuff that is included every night; Free restaurant meal every night with purchase of drink (must be at least 18 yrs old - meal unavailable from 6th January till 1st April 2014), free unlimited Wifi, free air-conditioning in all dorm rooms during Summer, free tea & coffee, free tour and travel information, and free book exchange! We also offer $5 transfers from the airport. We provide a 24 hour check-in service but you need to let us know in advance if you are going to arrive outside reception hours so we can organize your key (if you are arriving on a 2am tiger flight make sure you book your first night for the same date as your flight departure). Our reception is open from 7.30 am till noon, and between 4.30 pm and 8 pm. 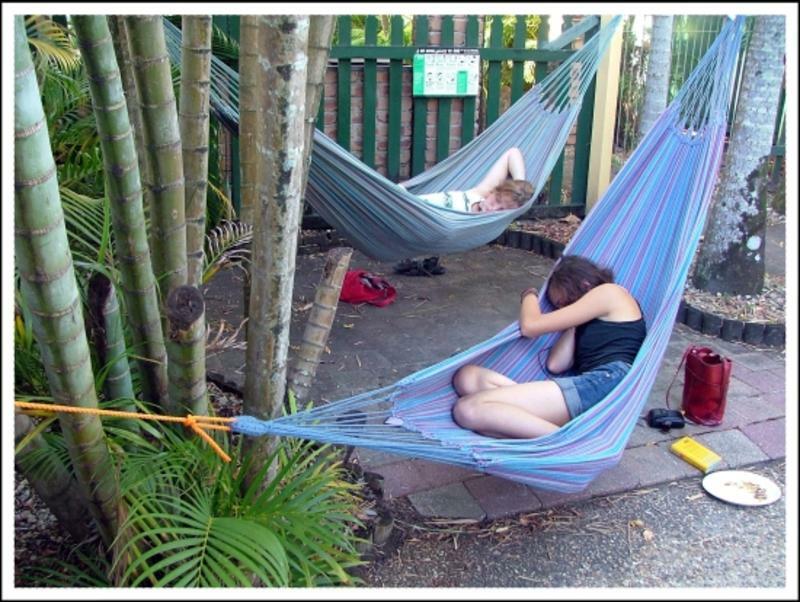 Cairns City Backpackers is the place to be if you want to chill out in a tropical oasis. We have a tropical garden which includes hundreds of palm trees, a great swimming pool and lots of hammocks for you to chill out in. Naturally there is a TV and DVD area, billiard table, and cheap internet with 24 hour access and bring your laptops because we have wireless! We offer clean and comfortable single, double, twin, 4 and 6 bed dorms. The dorms all include air conditioning except for the cooler months from April to September For private rooms air conditioning is an extra $4 per room. Please note that for children we have a minimum age of 18 years in a dormitory room, and a minimum age of 5 years in a private room. The friendly and helpful staff have lots of good local advice and information about tours including access to standby specials. We provide a 24 hour check-in service but you need to let us know in advance if you're going to arrive outside reception hours so we can organise your key. This is pretty important. If you're arriving on a 2am tiger flight make sure you book your first night for the same date as your flight DEPARTURE). Our reception is open from 7.30am till noon and between 4.30pm and 8pm. We don't have our own bus but there's a shuttle bus from the airport which costs $5 per person from the airport. This is a special discounted price given to guests of our hostel. To get this price you need to pre-book the shuttle bus on the Cairns Airport Shuttle Bus Website. Select 'Cairns City Backpackers' as your hotel destination and you will be given the special price. The shuttle bus runs during the arrival time of all flights. For domestic arrivals, please exit the airport building and go to bus parking zone (Bus Bay 6) for the FNQ Airport Shuttle Bus. For the international terminal, there will be someone waiting for you in the arrivals lounge; please wait until they come.If you have booked the shuttle bus and it is more than 15 minutes late, please call Don from Cairns Airport Shuttle on 0432-488783. A taxi will cost you about $22 from the airport and $10 from the bus terminals. If you wish to walk from the bus terminals we are a 15-minute walk to the premier bus terminal and a 30-minute walk to the greyhound terminal (walk straight down Spence street and right into Draper Street and follow until you find us). If you're coming by your own vehicle we're on Draper Street, directly behind Cairns Central Shopping Centre.